Toronto Maple Leafs prospect Rasmus Sandin was always expected to play a big role as part of Sweden's world junior entry but he now could see even more high-pressure minutes with AHL teammate Timothy Liljegren's presumed absence. Rasmus Sandin often heads over to Timothy Liljegren's place after the Toronto Marlies wrap up practice. "He's older, so he's got to take care of me," Sandin, 373 days younger than Liljegren, said with a cheeky grin in a recent interview. "We spend a lot time together." The plan was for Sandin, 18, and Liljegren, 19, to spend even more time together at the world junior hockey championship, but it's looking increasingly like Sweden will have to settle for just one of the Maple Leafs' first-round picks at the upcoming tournament in Vancouver and Victoria. Liljegren suffered a high ankle sprain earlier this month playing in the American Hockey League, and while he's continuing to rehab with Toronto's sports science team, it doesn't sound like he'll be healthy in time for the event that begins Dec. 26. "It's certainly understandable that he wants to push to play," Leafs general manager Kyle Dubas said Monday. "I just don't know that it's going to be realistic." A right-shot defenceman with offensive upside — just like Liljegren — Sandin was always expected to play a big role as part of Sweden's world junior entry. He now could see even more high-pressure minutes with his AHL teammate's presumed absence. 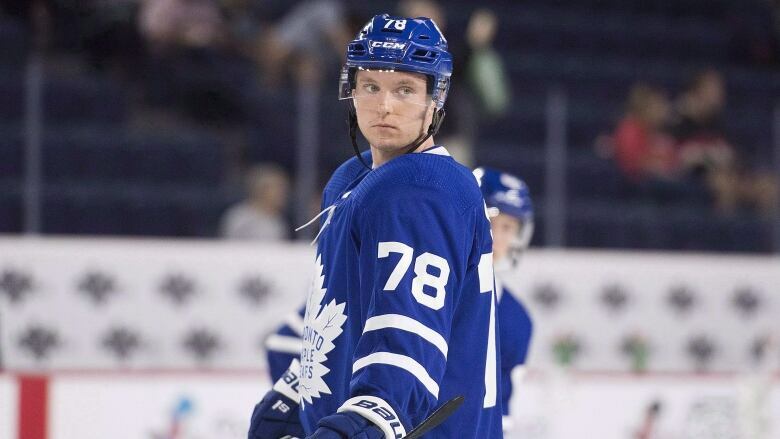 "He's remained steady for an 18-year-old and a later first-round [selection]," Dubas said of Sandin, the GM's first-ever draft pick in the top job at No. 29 last June. "He's been outstanding. I know they're going to rely heavily on him. "It's going to be a great opportunity." Sandin, who played for the Ontario Hockey League's Sault Ste. Marie Greyhounds last season, has five goals and five assists in 18 games with the Marlies, including a combined three points in back-to-back wins over the weekend before joining Sweden's junior squad. "It was a little different in the beginning, but I'm getting more and more used to it every game," Sandin said of adjusting to the AHL. "I feel pretty confident out there and it feels pretty good. "The players are stronger, they're quicker. You have to make your decisions even quicker." Marlies defenceman Frank Corrado, who has been paired with Sandin at different times on the Leafs' farm team this season, said the organization found a good one. "He's everything you want to see in a young player — great attitude, great demeanour," Corrado said. "He's not afraid to make plays, he's not afraid to be creative on the ice. He's got such a bright future, you can just tell. "I see a great kid and I see a great player." Sandin said pre-tournament conversations with Sweden's coaching staff suggested he should expect to carry a lot of the mail on a blue line that will also be without Buffalo defenceman and reigning No. 1 pick Rasmus Dahlin, but does have Adam Boqvist (eighth overall to Chicago in 2018) and Erik Brannstrom (15th overall to Vegas in 2017). "It would be good to get [Dahlin], too," joked the outgoing Sandin. "They kind of want me in the same role I get here, maybe even a bit bigger one — playing penalty kill, power play, everything. It's going to a fun experience. "It's been a dream my whole life to play at the world juniors." Dubas, meanwhile, said Liljegren's injury is a double-blow because he had impressed with the Marlies and was viewed as a potential NHL call-up later in the season for a Leafs team that has had issues moving the puck quickly from the back end. "It's really unfortunate because he'd been having an excellent season," Dubas said. "He moves the puck very well. "This is going to set him back for quite a few weeks." Sweden, which won silver at last year's world junior tournament, is in a group that includes the United States, Finland, Slovakia and Kazakhstan. The Swedes open their preliminary round on Boxing Day against the rival Finns in Victoria. "Playing for Sweden is always about trying to take a gold medal," Sandin said. "That's always the goal.